The Hawaiian archipelago is a string of islands and reefs, 3,300 kilometers long, that forms a broad arc in the mid-Pacific. The eight main islands of Hawaii–Oahu, Hawaii, Maui, Kauai, Lanai, Molokai, Niihau, and Kahoolawe–contain more than 99 percent of the state’s land area and all but a handful of its people. The island of Hawaii, at 8,150 square kilometers, comprises nearly two-thirds of the state’s total area, and it is often referred to as simply the Big Island. The smallest of the eight, Kahoolawe, is 125 square kilometers and is uninhabited. Hawaii climate is tropical with remarkable differences in climate within short distances. Overall, summer temperatures between May and October are warmer, peaking in August, and drier than the winter months. February and March are the coolest months when night temperatures on the coast fall to 15°C. During summer, the north-easterly trade winds are more persistent and constant blue skies are not uncommon for weeks on end. In the winter months, the trade winds are often interrupted by other winds, bringing intervals of widespread cloud and rain. During heavy winter storms, brought on by the onset of Kona winds from the south-west, 3-4 inches of rain can fall in an hour. The windward west coasts are more exposed to these winter storms and often receive their mean rainfall in just a hand-full of these winter storms. However, the most influencing factor of Hawaii’s weather is orographic – caused by the mountains. The higher the mountain the greater the extremes. Thus on the Big Island, the windward coast (north-east) receives an average 130 inches of rain each year whilst the dry leeward coast (west), protected from cloud by the 13,600 feet summits of Mauna Kea and Mauna Loa, receives less than 30 inches. Even the west coast of the Big Island rainfall and cloud cover vary – whilst the coast is mostly sunny and dry, less than 5-miles inland on the slopes of Mt. Hualalai in South Kona, sunny mornings often give way to afternoon mists and light rain. The wettest place on earth is on Mt. Waialele in the centre of Kauai – barely 30 miles to the south, the resort town of Poipu receives just 15 inches of rain a year, whilst the town of Hanalei on the supposed wet north coast receives a 45 inches, much of which falls at night or in winter bursts. Similarly, Waikiki Beach sits in the rain shadow of the Koolau Mountains and receives little rain except in the occasional tremendous bursts of thunderstorms which build up in summer afternoons. Climate also changes 2°C for every 1000 feet making temperatures on Hawaii’s highest peak fall consistently below zero in winter resulting in snow. The slopes of upcountry Maui and the Big Island, including Volcano National Park are therefore much cooler than the coast. Hawaii does receive the occasional cyclone (mostly from July to October, although the official cyclone season ends in January) although these are less frequent than in the southern pacific. Sea temperatures fluctuate from a high of 27°C in summer to 23°C in winter. The longest and shortest days are 131/2 hours (summer) and 11 hours (winter). The marine ecosystem around Hawaii is both complex and dynamic. In the near shore areas on most islands there is little shallow shelf area, with narrow fringing reefs and limited shallow bays and lagoons. There is no highly productive shallow continental shelf as in the mainland USA, and thus although near shore fisheries are important both socially, recreationally and commercially, fishery production in Hawaii is dominated by catches from the pelagic or open ocean. Pelagic ecosystem dynamics on all temporal scales may be driven by the dynamics of very specialized oceanic habitats. In the North Pacific, in proximity to Hawaii, is a basin-wide chlorophyll front located at the boundary between the low chlorophyll subtropical gyres and the high chlorophyll subarctic gyres. This front is over 8000 km long and seasonally migrates north and south about 1000 km. In the winter this front is located at about 30-35 deg N and in the summer at about 40-45 deg N. It is a zone of surface convergence where cool, vertically mixed, high chlorophyll, surface water on the north side sinks beneath warm, stratified, low chlorophyll water on the south side. Data on movements of loggerhead turtles and detailed fisheries data for albacore tuna show that both apex predators travel along this front as they migrate across the North Pacific. The dynamics and movement of this front appear to vary substantially in response to the El-Nino-Southern Oscillation (ENSO) phenomenon. The movement of the front can have a major impact on the Hawaii Archipelago, when it moves south and bathes the Northwestern Hawaiian Islands, creating an order of magnitude change in the near shore productivity of the ecosystem which affects populations of reef fish, spiny lobsters seabirds and monk seals. 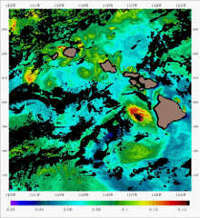 In the Main Hawaiian Islands there are features such as the presence of the presence of counterclockwise rotating vortices, or cyclonic eddies, that spin up on time scales of 50–70 days in response to a combination of the Hawaiian Islands’ topography and the prevailing northeasterly tradewinds in the lee of the islands. These meso-scale (100 km) features are particularly conspicuous or frequent than in the Alenuihaha Channel between Maui and the Big Island of Hawaii. Cyclonic eddies in subtropical waters, such as those around Hawaii, vertically displace the underlying nutrient rich waters into the overlying, nutrient-depleted euphotic zone (the surface water layers through which daylight can penetrate), creating localized, biologically enhanced patches. Such features can have major influences on fish catch and catch rates, as evinced by the presence of such an eddy in 1995, which significantly altered the typical spatial distribution of blue marlin catches by the Hawaii International Billfish Tournament (HIBT) in that year. The resulting distribution of fish catch differed significantly from the tournament’s average historical catch patterns, suggesting possible direct (e.g., physiological limitations) or indirect (e.g., prey availability) biological responses of blue marlin to the prevailing environment. Such oceanographic features may also have similar impacts on other pelagic fishes around Hawaii.